What happens if you decide to sell your collection through a public auction rather than direct to a dealer? We take a step-by-step guide through selling a collection by auction sale using the well-known auctioneers of stamps and coins, Warwick and Warwick, of Warwick, who have been conducting public auctions since the 1960s. The potential vendor sees the Warwick and Warwick advert in Stamp Collector and speaks to the stamps expert. After ascertaining that the collection has sufficient value to sell by auction, Richard travels to the vendor’s home, meets her, examines the collection and discusses the merits of selling by auction. He gives the vendor a receipt and returns to Warwick with the collection. The collection is examined in detail and the precise estimates and best lotting arrangements determined to maximise total realisation. A valuation report and acceptance form is posted to the vendor, who sets her reserves (or leaves it to the auctioneer) and returns the signed form to Warwick. The collection is broken down by an expert, described onto a computer program and every lot is scanned, those which will appear as printed photos in the auction catalogue being put to one side to be taken to the printers for scanning. Once all the scanning is complete, all the lots from the collection are collated on hundreds of feet of shelves, so that there is logic to the catalogue, making it easier to read for the buyer. When the breaking is complete, the sale is numbered and the catalogue is sent electronically to the printers, in Hampshire. Printer’s proofs are checked and the sale catalogue is then posted on the Warwick and Warwick website, whilst the printed catalogue is dispatched by post. Viewers are crucial to a good auction result and there are seats for over fifty viewers at any one time in the Warwick and Warwick showrooms. Viewing takes place over four days and many viewers book into local hotels. Commission bids are received on a daily basis, by post, over the phone, by email and via the website. These are logged as they are received, with the earlier bidder gaining precedence in the case of similar bids. Auction day arrives. The auctioneer has to take into account commission bids already received, bids being received via telephone lines and floor bids. 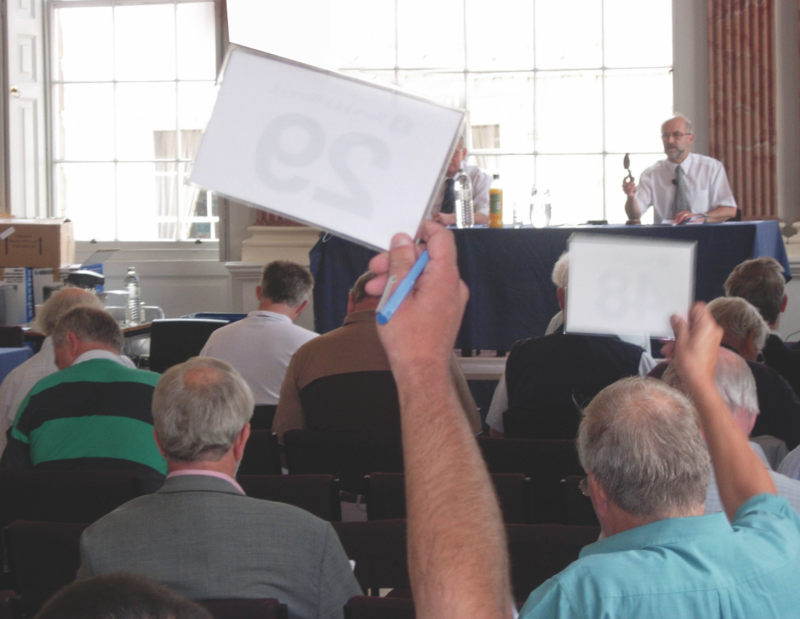 Holding a bid card (or paddle, as it is often termed) firmly and distinctly in the air until the bidding has exceeded your limit is the easiest way to bid and the method most favoured by the auctioneer. Settlement of accounts and lot distribution to successful bidders takes place immediately for room attendees. Invoicing and lot pulling for successful commission bidders takes place the next day. The vendor is notified by post of the outcome of her lots in the sale. At the same time advice is given concerning any lots remaining unsold. Thirty days after the sale the vendor receives a cheque for the net proceeds.